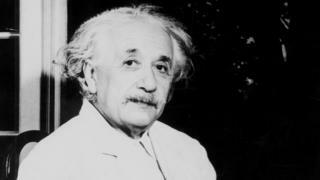 Image caption An Indian scientist said that Albert Einstein (pictured) was wrong and that gravitational waves should be renamed "Narendra Modi Waves"
Some academics at the annual Indian Science Congress dismissed the findings of Isaac Newton and Albert Einstein. Hindu mythology and religion-based theories have increasingly become part of the Indian Science Congress agenda. But experts said remarks at this year's summit were especially ludicrous. The 106th Indian Science Congress, which was inaugurated by Prime Minister Narendra Modi, runs from 3-7 January. The head of a southern Indian university cited an old Hindu text as proof that stem cell research was discovered in India thousands of years ago. G Nageshwar Rao, vice chancellor of Andhra University, also said a demon king from the Hindu religious epic, Ramayana, had 24 types of aircraft and a network of landing strips in modern day Sri Lanka. Another scientist from a university in the southern state of Tamil Nadu told conference attendees that Isaac Newton and Albert Einstein were both wrong and that gravitational waves should be renamed "Narendra Modi Waves". Dr KJ Krishnan reportedly said Newton failed to "understand gravitational repulsive forces" and Einstein's theories were "misleading". Narendra Modi: Is hardline Hindu politics failing India's PM? Critics said that while ancient texts should be read and enjoyed - it was nonsense to suggest they represented science. The Indian Scientific Congress Association expressed "serious concern" at the remarks. "We don't subscribe to their views and distance ourselves from their comments. This is unfortunate," Premendu P Mathur, general secretary of Indian Scientific Congress Association, told the AFP news agency. "There is a serious concern about such kind of utterances by responsible people." India has a mixed relationship with science. On the one hand, it has a rich tradition of outstanding scientists - the Higgs boson particle, for example, is named partly after an Indian physicist and Einstein's contemporary, Satyendra Nath Bose. Particle physicist Ashoke Sen, meanwhile, is the recipient of Fundamental Physics Prize, the world's most lucrative academic award. But it also has a long tradition of replacing science with myths, leading to a fringe culture of pseudoscience. Many believe under Narendra Modi's Hindu nationalist BJP party, pseudoscience has moved from the fringe to the mainstream. Mr Modi himself set the tone in 2014 with his outlandish claim that cosmetic surgery was practised in India thousands of years ago. Many of his ministers followed suit with similar claims. India's top science summit also started inviting academics with Hindu nationalist leanings who have made equally bizarre claims. Such claims usually hark back to an imagined glorious Hindu past to bolster religious nationalism. The BJP and its hard line allies have for a long time mixed mythology and religion to bolster political Hinduism and nationalism. Adding science to the mix, say critics, will only help propagate quack science and erode scientific temper. Also, as economist Kaushik Basu says: "For a nation to progress it is important for people to spend time on science, mathematics and literature instead of spending time showing that 5,000 years ago their ancestors did science, mathematics and literature."